A big thanks to the author as I got this book through goodreads first reads.The book revolves around Solankhis clan and the troubles they face post great floods. It explores the foundation of today's blind faith being laid thousands of years ago.The writer has kept it short and smooth but in this smooth ride you get an abrupt halt when you come across two characters whose names are neither time nor place appropriate because all other characters have Indian names so when author introduces Steel heart and Leopard paw it leaves you wondering. Possibly author had some justification in doing so.The characters are nicely woven into the story but there is utter lack of female characters. For instance,we do not know anything about Raghu's mother and what role she played in shaping up the man he was. The illustrations inside the book are good but I think cover image could have been more relevant.Despite some flaws,this book is a good one time read. 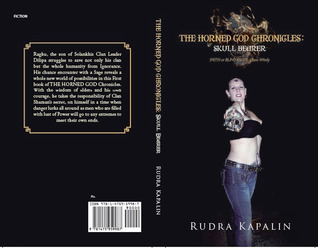 Being the Author of the book, I won't rate it.I hope all of you enjoy the 1st book of the series THE HORNED GOD CHRONICLES.This book has been deliberately kept short as it is meant to be an introductory book of the series, that was needed to clarify the kind of the world this series will be presenting to you.Won't keep you waiting for the 2nd part. Rudra Kapalin - A B.Tech in Electronics and Communication with an experience of around 6 years decided after giving a try to 'Making a living' that it was enough and now it is time to follow his passion so that he can enjoy every second of his life.When asked who he is, he said:One human among seven billion others.Quest to understand one's real self has been a never ending quest for Human Species.When you ask, "Who am I? ", the answer is "Who am I".Just the question mark is the difference between the question and the answer. That is the only difference between asking and knowing.The answer is, "WHO AM I".The only difference between me and others is that I am living and not merely surviving. I will be truthful, unafraid and unmerciful in everything I write as that is what makes me happy.